Of all the things that make living in the California Bay Area a blessing and curse, there’s not one greater to me than the wealth of farmers’ markets. Every weekend (and sometimes weekdays) for the majority of the months of the year, the farmers, growers and artisanal food makers who produce nearly 80% of the country’s food sojourn to suburbs and cities to sell their wares. Saturday and Sunday mornings, people from all walks of life converge on them to browse, taste and buy whatever from the current season and crop is on offer. My Saturdays are often filled with errands and kid craziness, and Sunday morning are for feeding my soul, so I don’t get to go my local farmers’ market as often as I would like. But when I do, I am struck by how elevated and joyful my mood is in comparison with the day to day experience of my local grocery store. The vibrant color of the produce, the aromas wafting from the cooked food stalls, the hum and bustle of vendors and buyers as they wander and sample stimulate all of my senses. And my wallet. It is rare that I go to a farmers’ market without buying something – apples or peaches for a pie (especially if they are an obscure variety Safeway doesn’t yet know about), leafy greens to saute (yes, with bacon) or turn into a salad, or heirloom tomatoes for my famous bruschetta. Knowing the inherent quality of produce that has been picked only hours ago and transported directly to me via a farmer’s beat-up van, instead of a refrigerated semi-truck, it is impossible to not feel compelled to take some home. I would love to say that I am as speedy and reverent in getting the food from the market to my dinner table as the growers are in getting it to the market, and sometimes, I am. But on other days, busyness and brain-like-sieve syndrome take over, and what I’ve purchased becomes food for fruit flies and then our compost pile, or my chickens. The remorse I feel as I throw the produce away isn’t merely over the wasted money, but it reflects the squandering of the sweat and toil of the ones who faithfully grew it for me. Fruit is meant to be eaten. 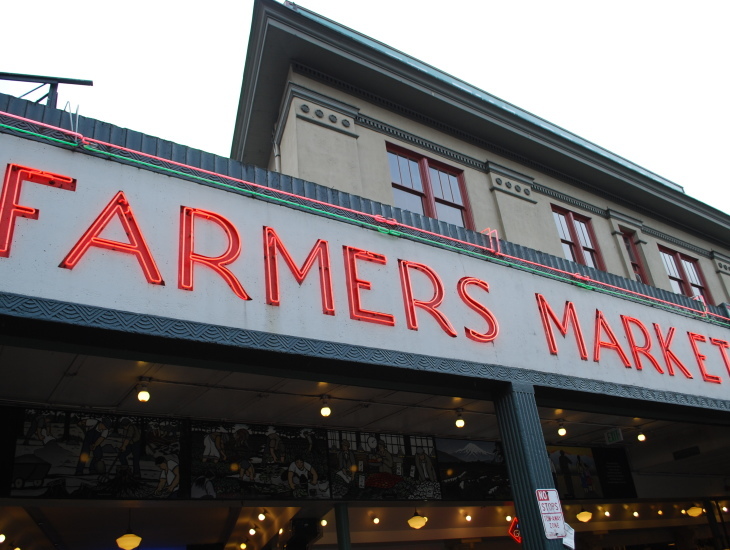 When we were talking about our goals for this web project, the metaphor of a farmers’ market seemed to fit with our intent. Our goal here is to offer up a cornucopia of resources that will nourish women’s souls with the perfect food of the gospel. The gospel isn’t meant to just intersect with every aspect of a woman’s life. It is meant to intervene in every aspect, to transform us from the inside out so that we are complete, and completely beautiful, reflections of the God in whose image we are made. What’s offered here is not meant to stay here, because the Here of the Internet is not the primary place where the gospel is lived out (Selah). The gospel is lived out at kitchen counters and cubicles and car rides. There’s no question that there are a lot of opportunities for the gospel to intervene in our interaction with the Internet! But it is the moments of so-called real life – when the life-altering phone call comes, or the paycheck doesn’t, when a woman hears “I don’t love you anymore” from her husband or “I hate you” from her son – that the intervention of the gospel is needed the most. It is to the great praise of God’s glory that we can say that this message about the gospel being at the center of all of life isn’t new at the moment. It’s actually kind of trendy. But what makes us reticent is that, while beautiful and true, left on its own, it’s incomplete. It’s only in understanding how the gospel transforms us that its centrality is worked out. It’s this how of gospel transformation in the lives of women that we want to focus on here. We want this site to be a place where we look at all of Scripture and unpack exactly how God’s work through Christ transforms us in thought, word, and deed. We want women who read here as individuals to be strengthened through fresh insight into this how that results in real hope and real growth in their day to day life. But we also want women, and men, who read here as either vocational or lay workers in discipleship ministry to women, to be equipped to work out these truths on a larger scale in their own churches and communities. And speaking of the local church and local communities, a quick word about what we are not trying to do. We are not attempting to build the Christian equivalent of an Emeril Lagasse-like empire of restaurants, Food Network shows, sitcoms, cookware lines and toothpaste commercials (yep, he really did that). One of the benefits of having been part of the Christian Internet for a while now is seeing how different approaches to leveraging web media for the advancement of the gospel can either feed worldly celebrity, or keep it in check. In that regard, we wholeheartedly embrace John the Baptist’s words that Jesus must increase, and we must decrease. We won’t be investing a lot of time on website spit and polish that does not directly serve the readers. No thoughts about brand. No Brady Bunch lineup of pictures of our faithful contributors. (No disrespect is meant at all to those sites who choose to include those – it’s just that we literally don’t have them and would rather invest that time in producing more content). We have no growth goals for our site intrinsically – just growth hopes for women in their homes and churches and communities. We hope as you browse through this site, you will find resources that fuel that growth – that offer a farmers’ market of spiritual food for women’s souls. And that the growth it energizes produces yet more fruit, all for the glory of Christ and the growth of His kingdom. I am really excited about this web resource. I pray that it will be all you describe and more as God uses you as His instruments in the lives of many.